Although CAKE is a first-touch tracking platform by default, we allow the option of using a last-touch setting instead to credit conversions to the last source that generated a click from a user. Normally, a cookie is placed on the user's browser when they first click on a link for an offer. Any clicks that occur for that offer after that first click are de-duped by CAKE within the cookie duration (which is 30 days by default). 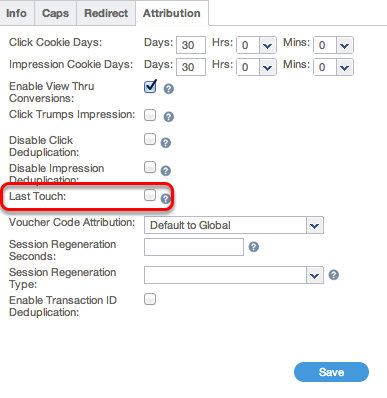 With last touch, with each click from a new Affiliate, CAKE will count that click as a unique click and overwrite the cookie existing on the user's browser with a new one, re-setting the cookie days from that point. When the user converts, it will read that cookie and credit the conversion to the most recent Affiliate who generated a click from that user. The Last Touch setting is located in the 'Attribution' tab on the Offer card. This allows you to have a longer cookie-duration to de-dupe duplicate clicks from each Affiliate while still crediting the Affiliate closest to the conversion.